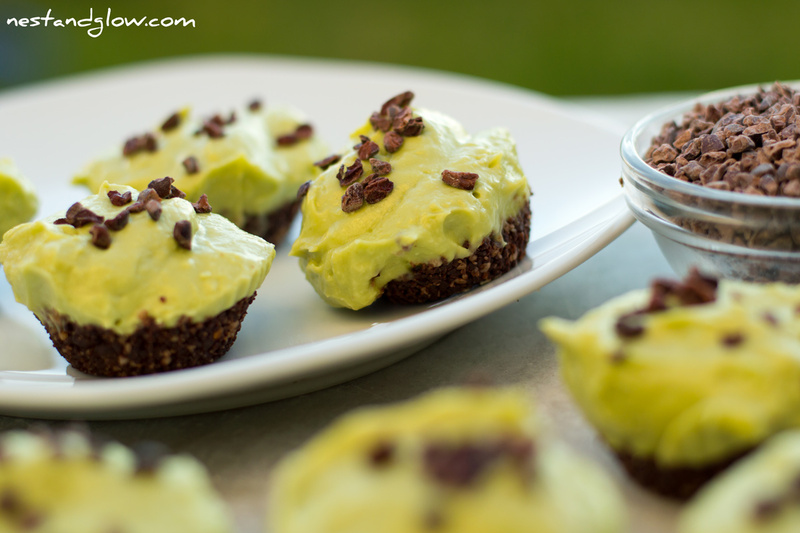 Healthy little cheesecake bites that are a vibrant avocado green with a dark cacao base. These can be stored in the freezer for months and then popped out when you want a sweet bite. Perfect to always have a few in the freezer for a nutrient dense sweet snack on hand. 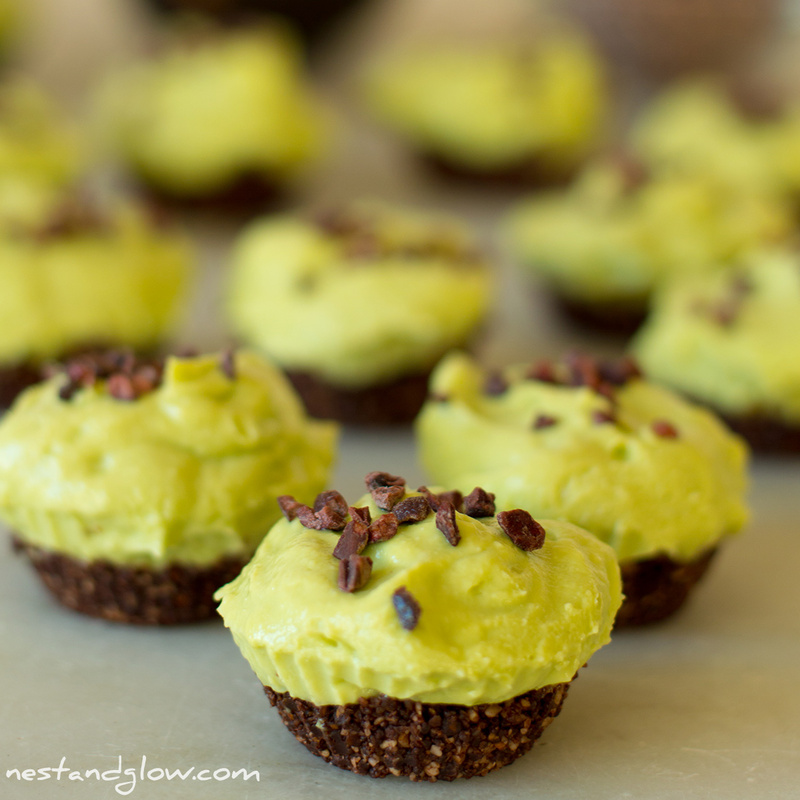 Suitable for raw vegan, gluten-free and general healthy wholefood diets. I’m using just a small amount of coconut butter to help these set, but this is totally optional. You can leave out if you prefer. You can use any nut you like in the base or make nut-free by using sunflower or pumpkin seeds. Here I made several mini cheesecake bites just for variation and because they set quicker. If you prefer you can make one big cheesecake using an 8-10″ springform pan using the same recipe. Some people are put off by the idea of avocado in a desert and often I hide it by adding cacao powder and without the green colour no-one can taste it without knowing it’s there. 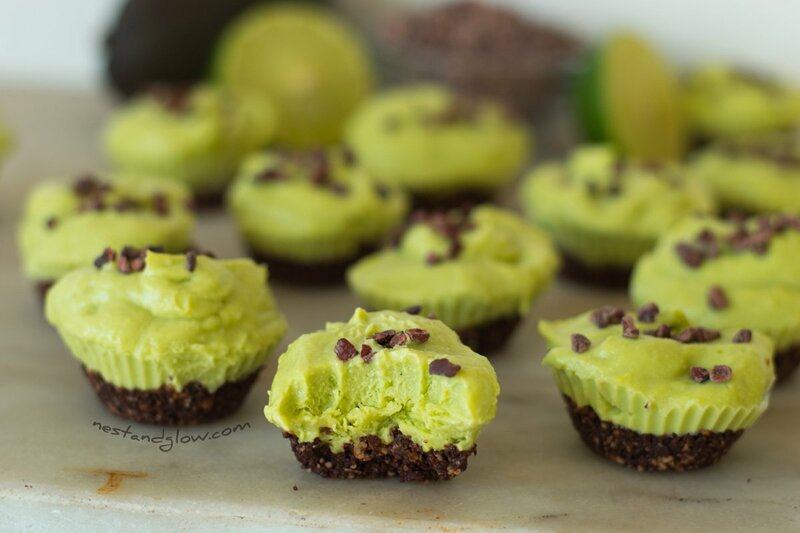 For this recipe, I wanted to celebrate the avocado rather than trying to mask it and I thought the vibrant green would contrast well with the dark chocolate. I recommend using silicone mini-cases about 1″ in diameter as they are rigid and keep their shape when you press in the base mixture. Well cared for silicone trays last for years – the ones I’m using here I’ve had for over 8 years and they are still going strong. 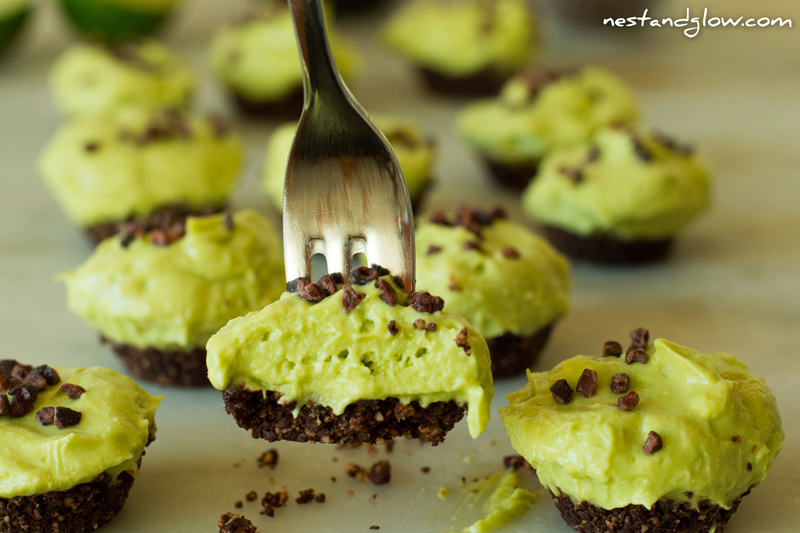 This recipe would also work well with mint in place of the lime for a chocolate mint avocado cheesecake. 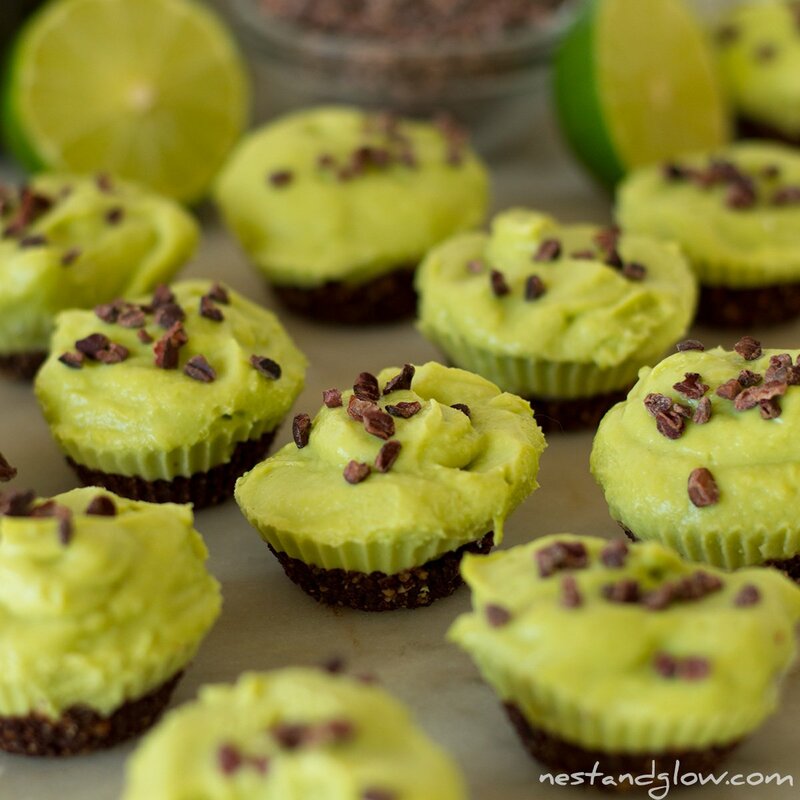 To adapt this recipe for mint chocolate avocado then replace the lime with a splash of water and a few drops of peppermint oil or a 1 tsp of peppermint extract. I’m using a small jug/bullet blender and a food processor. The food processor is better at making the base and the jug is better at making a smooth filling. You can use just one of either but it will take longer to make the other part of the recipe in the other device and may need some scraping. My blender. Always choose desiccated/shredded coconut that is unsweetened – the dates have more than enough sweetness. Lime zest is full of flavourful and fragrant oil so I always like to grate a bit to go on top. However, I couldn’t get any organic or unwaxed limes so the ones I had were treated with several different types of e-numbers so just topped with the cacao nibs. If you can get organic ones then a few lime zest shreds look and taste great on these. As with all my recipes, this is made all from natural produce and they can vary a lot in sweetness, taste and size. Therefore always taste as you go if you are unsure and adjust to your preferences. This isn’t baking with highly refined ingredients like white flour, white sugar and butter so it’s not a science. Maple syrup is generally accepted on a raw food diet. But this sweetener can be replaced with date syrup, coconut nectar or any other similar sweetener. You can use coconut sugar but I would advise mixing with some additional water as it’s not a liquid sweetener. The coconut or cacao fat is optional but does help it set firm. I make this oil-free using my own recipe to make coconut butter that is pure coconut with nothing taken away and retains all of the fibre. Blend all of the base ingredients together until they stick together when pressed. Juice the limes and place in a small jug blender with the avocado flesh, sweetener, melted coconut or cacao butter and blend until smooth. 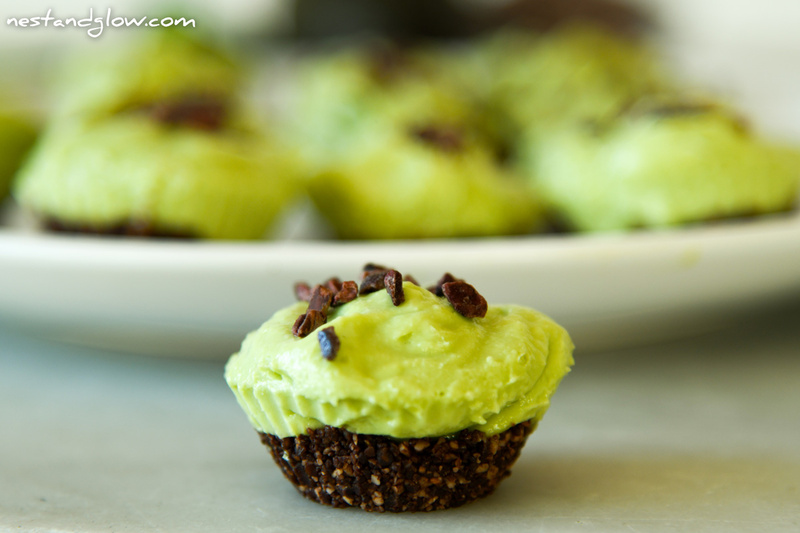 Spoon the base mixture into your cases/tin, push firmly with your fingers and dollop on the avocado lime frosting. Top with the cacao nibs and lime zest then place in the freezer to set. Enjoy out of the freezer after 2 hours if in individual cases or 3-4 hours in one large cake. If you freeze for longer just take out half an hour before enjoying. Will last at least three months in the freezer. Equipment: Small blender, Food processor, Silicon cases or a large springform cake pan. How do we take it outside if we want to serve it in a big party/ picnic, with lots of other items to be had, will it become soggy if left out for a long time?